One major local ecosystem that I’ve so far given little attention to on this blog (probably because, unlike the beach and maritime forest, it’s not within walking distance of where I live) is the salt marsh, the wet, grassy plain that fills most of the area between the island and the mainland. Salt marsh ecology is one of the most popular field classes with the kids who come to the center, so yesterday I finally took my camera with me and got some photos of its plant and animal life – this is going to be the first in a series of three salt marsh posts. 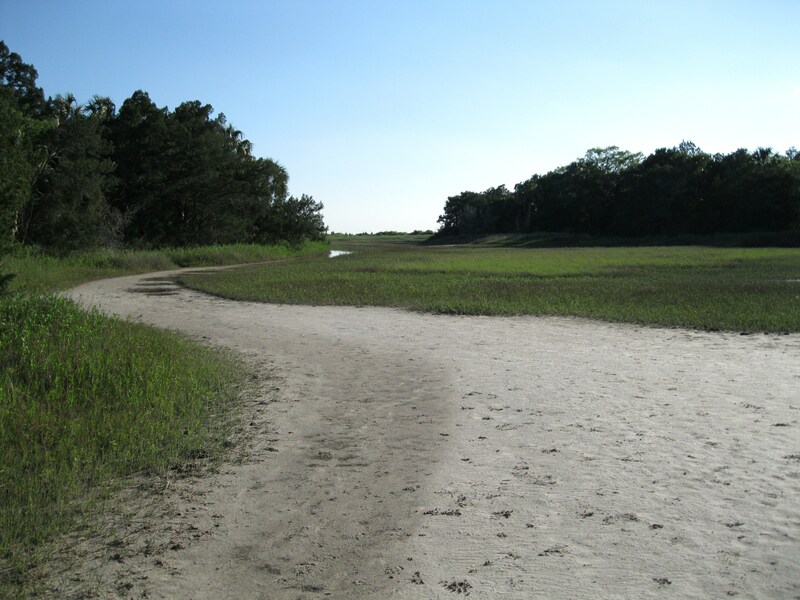 The salt marsh can be roughly divided into three zones based on differences in elevation. The small areas of high ground where cedars and palms grow are known as hammocks – you can see these on either side in the photo above. “High” is a relative term, as they may be only a few inches above the surrounding marsh; they just have to be elevated enough to stay dry when the marsh floods at high tide, or else the trees wouldn’t be able to survive there. Both of these are edible, at least in small quantities; their leaves are pleasantly crunchy and (of course) very salty, and we usually encourage our students to try them. 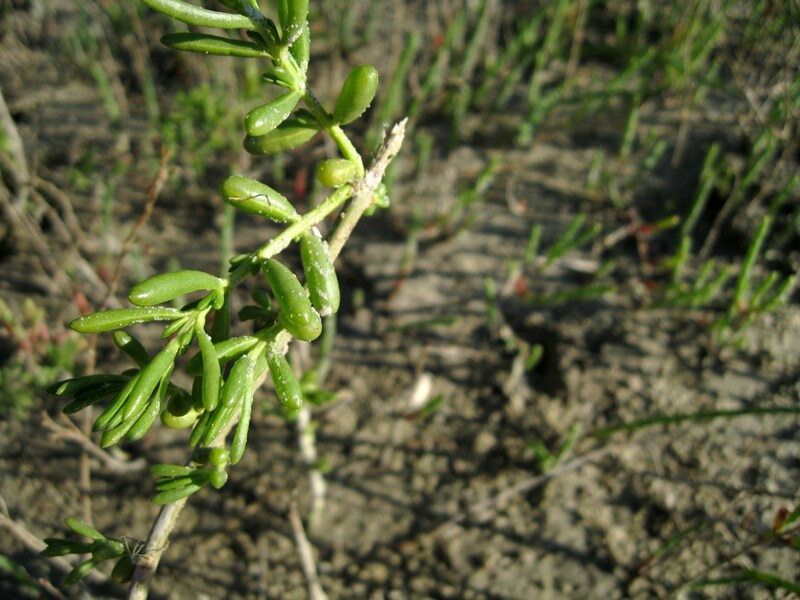 I was amused recently to see a rerun of Top Chef in which one of the contestants used a sprig of glasswort as a garnish with his dish. As you move further out from the hammock, you leave the high marsh behind and enter the low marsh, where the saltwort and glasswort are replaced with Spartina grass and the stinky black mud that forms when the grass dies and decomposes. (The smell comes from the gases released in the anaerobic reactions by which bacteria break down the dead grass.) If you’re a fifth-grade boy, your main concern at this point is how muddy you can get! So to recap, hammock -> high marsh, including salt pans -> low marsh. The driving force behind this stratification is the tides; if you’re a little higher than your surroundings, you can stay dry even at high tide, while if you’re a little lower, you may always be wet even at low tide. 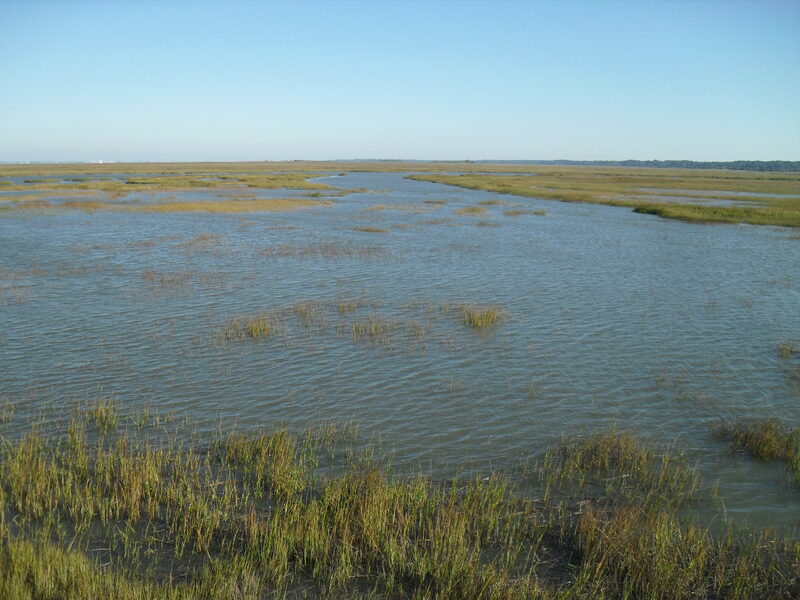 Salt marshes are found all along the east coast of the U.S., and the sediment-trapping abilities of the plants found here play a crucial role in keeping coastlines stable. They provide a buffer zone against hurricanes and are crucial stopover habitat for migrating birds as well as habitat for many economically important seafood species. Later this week I’ll post about two of the most common critters found here, so be sure to check back! Informative post. Learned several things about this important ecosystem & Im looking forward to the next posts. Good job! I enjoyed reading this. I like the detail you provide. 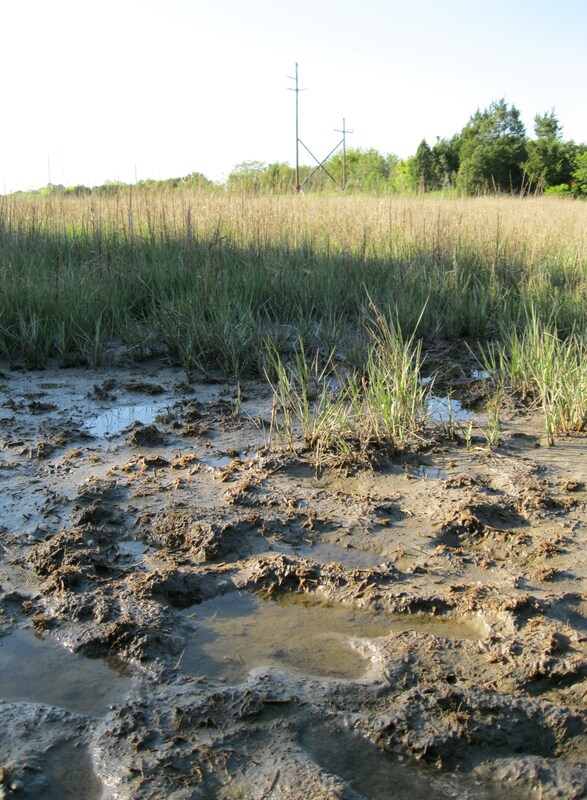 And a buffer zone provided by salt marshes. I look forward to reading about the critters. Nature is so varied. Always something new to learn and see. 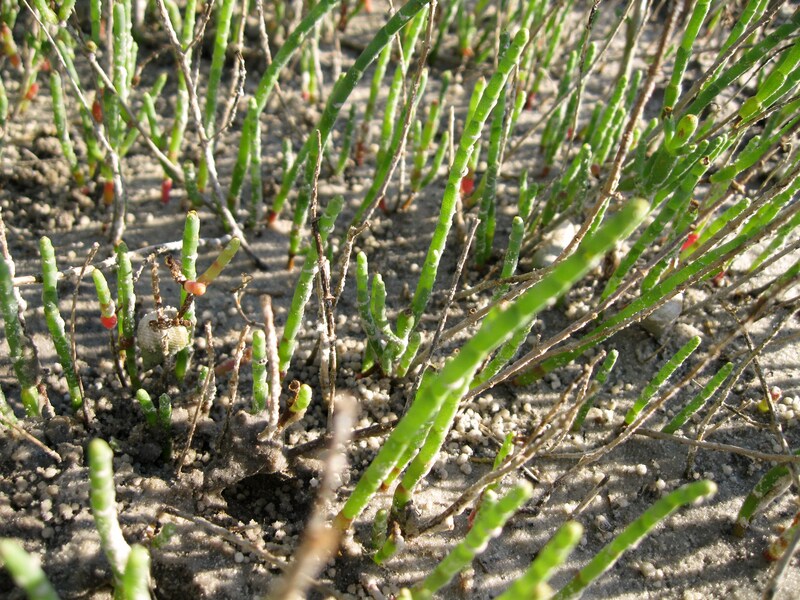 I like the glasswort in a dish. That’s just amazing. I love reading your descriptions along with your delivery. Very good.